Whether youre a couple looking for a romantic beach retreat for an upcoming getaway or a small family searching for a spot to spend a week relaxing by the seashore, Sea Dream is the perfect choice for your next Outer Banks vacation! This spacious two-bedroom, two-bathroom condo is located directly on the oceanfront, in the Admirals View condominium complex in Kill Devil Hills. Youll be treated to spectacular views of the Atlantic Ocean, right outside your back door. Step onto your private oceanfront deck at the break of dawn to watch the sun rising out of the water as you sip your morning cup of coffeeor sit back in a comfy chair and enjoy a salty sea breeze as you dive into a brand-new book and listen to the sounds of the surf rolling in. In addition to being a first-floor unit, Sea Dream also offers a convenient Stair Tamer cargo lift to help you easily transport your familys luggage and groceries from the car to your condo without having to carry them up the stairs. And when youre ready to unwind after a long day of splashing in the surf and strolling along the shoreline, you can lounge on the living room couch and tune into your favorite shows courtesy of Sea Dreams streaming TV service, which also includes Netflix. 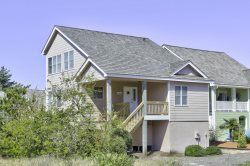 When you spend your Outer Banks vacation at this cozy condo in Kill Devil Hills, youll find that your home away from home is located right in the heart of town. Centrally located at milepost 7, Sea Dream provides easy access to an assortment of amenities and attractions you'll want to check out during your stay. A large shopping center situated less than half a mile away from the Admirals View condominium complex features a Food Lion grocery store, Chinese food caf, Mexican restaurant and pizza parlor, as well as a Belk department store. And the foodies in your family will be pleased to discover that a wide array of delicious local dining establishments are all within just a short walk or drive from Sea Dream. Youll have a variety of choices nearby, including Goombays Grille & Raw Bar, Jolly Roger Restaurant, Makos Beach Grille & Bar, Awful Arthurs Oyster Bar and the Beachside Bistroall of which are located within less than one mile from your cozy condo. In addition to its proximity to an assortment of Outer Banks restaurants, Sea Dream is also conveniently located close to several popular landmarks and attractions. The Wright Brothers National Memoriala historic site commemorating the worlds first powered flight, which was achieved by Wilbur and Orville Wright on Dec. 17, 1903is just a five-minute drive from this Kill Devil Hills condo. The Avalon Fishing Pierwhich serves as an excellent spot for casting a line in search of the catch of the dayis less than a mile up the beach road from Sea Dream. Venture to the end of this iconic Outer Banks landmark to watch the waves rolling in beneath you and to catch a glimpse of dolphins swimming by as they make their way up and down the shoreline. Outdoor enthusiasts looking for a great place to spendthe day hiking and scoping out area wildlife can take a 10-minute trip to the nearbyNags Head Woods Preserve. With seven unique nature trails winding through 1,400acres of maritime forest and saltmarshes, this scenic nature preserve situated along the shores of the Roanoke Sound is a one-of-a-kind spot to explore when youre not spending the day at the beach! Sea Dream offers everything you need to make your next Outer Banks vacation the best one yet - book your stay today!